2015 marks the centennial of the dedication of the Cathedral of Saint Paul in the Twin Cities in Minnesota. The following article and the issue’s documentation call attention to this momentous occasion. Cathedral thinking. The phrase has been in the air for some years—not as one might expect, under the domes and arches in churches, but in the marketplace. Though an architectural metaphor, it has been heard from the corporate offices of Strategic Design, Duke Energy, TEDx, and the Ford Corporation in contexts larger than architecture. It describes the mindset one adopts when building a cathedral, a concept that recognizes the care and commitment of people who contribute to a cause, even though they will never see the completion of the decades-long task. It is this metaphor that rings true as we study the first one hundred years of the Cathedral of Saint Paul in Saint Paul, Minnesota. The cathedral whose centennial we celebrate this year was not the first Cathedral of Saint Paul; it is, in fact, the fourth Cathedral of Saint Paul. In 1840, the city now known as the City of Saint Paul was a river settlement known as Pig’s Eye. It provided the commercial needs of the French Canadian fur trappers and traders who first inhabited Fort Snelling just ten miles up the Mississippi River. Father Lucien Galtier was sent to minister to the spiritual needs of a fast-growing pioneer community. It was he who gathered the men together in 1841 to build the Chapel of Saint Paul on a bluff overlooking the Mississippi. The chapel, a log cabin measuring roughly twenty-five feet long and eighteen feet wide, was later enlarged to accommodate the growing congregation. And it was this structure that became the first Cathedral of Saint Paul on July 2, 1851, when Bishop Joseph Cretin arrived to take up his mission as the first bishop of the new Diocese of Saint Paul. 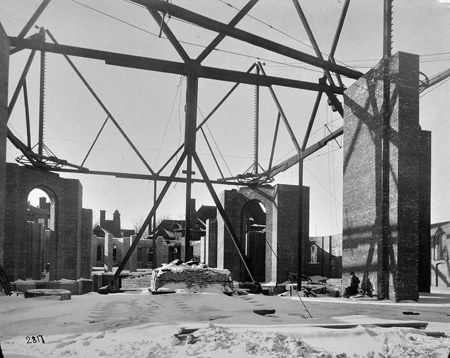 The construction of the second Cathedral of Saint Paul, in the center of the city at Sixth and Wabasha, followed almost immediately. A three-story building measuring roughly eighty-four feet by forty-four feet, it too was hopelessly cramped from the day of its dedication. In 1854, the year Saint Paul became an incorporated city, work began on the third Cathedral of Saint Paul just across Sixth Street from the second Cathedral of Saint Paul. This structure was planned as a grand edifice of stone, but the financial panic of 1857 dashed those ambitions, and a solid structure devoid of any architectural treatment was completed in 1858. It was from the altar of the third cathedral that the inspiration for a new cathedral came. On Holy Thursday in 1904, Archbishop John Ireland, distressed by the crowds of worshippers forced to stand outside to attend Holy Week services, decided the time had come to build a fourth—and larger—cathedral. The construction of the fourth Cathedral of Saint Paul began in 1904 with the purchase of the Kittson property in the upscale Summit Avenue neighborhood of Saint Paul. Purchased for $52,000, the site on Saint Anthony Hill overlooked the city and occupied a spacious lot. With the property secured, Archbishop Ireland called together an executive building committee, a group of twelve lay persons and six clergy. The selection of a project architect was a rigorous process. The executive building committee initially identified eleven firms for consideration: eight from New York, one from Washington D.C., one from Boston, and one from Chicago. They hired Glen Brown, secretary of the American Institute of Architects, to advise the executive building committee in this important decision. The field was reduced to four very shortly, and before the architectural design competition could be initiated, Archbishop John Ireland chose Emmanuel L. Masqueray for the job. The executive building committee invited Masqueray to Saint Paul for an interview, and on March 20, 1905, Masqueray was notified by letter of his selection as the architect. Masqueray quickly prepared preliminary drawings and presented them to the building committee on June 1, 1905. 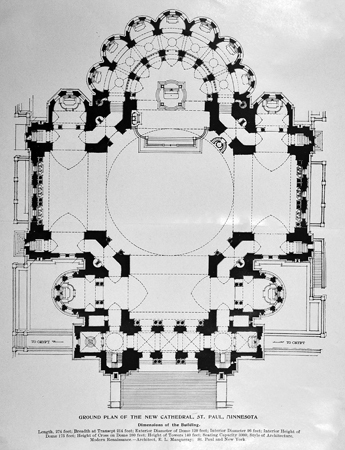 Those preliminary drawings affirmed the committee’s decision: they saw in these drawings the merging of their and Masqueray’s visions for the cathedral. Soon after, Masqueray left for a four-month tour of the great cathedrals of France in search of inspiration. When he returned he presented completed final drawings to the building committee—and the work began. Construction began on the cathedral in August of 1906 with the award of a contract for the first half of the foundation; in 1907 a contract for construction of the second half of the foundation was awarded. The contract for the construction of the cathedral walls was let in August of 1909. The walls were constructed of beige Rockville granite sourced from Rockville, Minnesota, about eighty-five miles northwest of Saint Paul. Masqueray’s stone details were exquisite, and granite workers were challenged to deliver the ornate details called for in the plans. The contract for construction of the roof and dome was awarded in September of 1912. Steel was provided by the Saint Paul Foundry, a local manufacturer, truss designer, and fabricator. 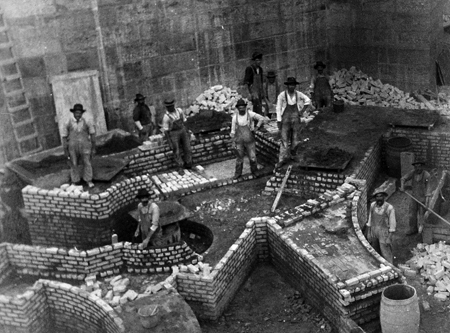 The ninety-foot-diameter dome supplied by the foundry is supported by the granite walls. 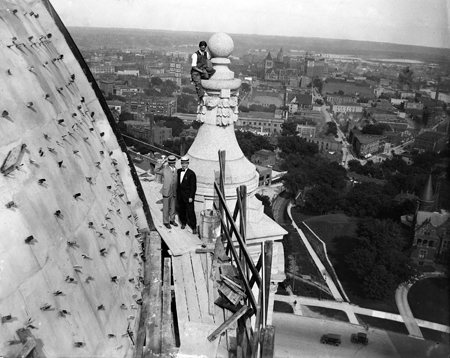 The exterior of the cathedral was officially completed on May 18, 1914, as a fourteen-foot cross was put in place atop the dome. Just a month earlier the firm of Beil and Hermant had been selected to complete the ceiling under the dome. Leon Hermant, a colleague of Masqueray, had an impressive résumé. He had contributed to the design of the French Pavilion for the Louisiana Purchase Exposition and had designed the Louis Pasteur monument in Chicago’s Grant Park. The sanctuary apse was completed and the first Mass celebrated in the cathedral on Palm Sunday, March 28, 1915. 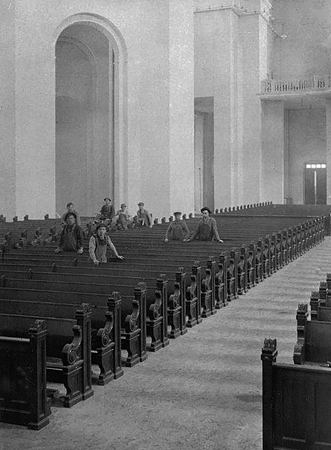 The cathedral was dedicated on April 11, 1915, in a festive ceremony. But it would take years before the stark white-washed walls, the clear window glass, and the empty chapels would be completed with the ornate interior we see today. It took more than forty years for the cathedral to be judged “complete”—complete enough for the solemn consecration on October 14, 1958. Since that date other embellishments have been added to continue the work. My firm, Toltz, King, Duvall, Anderson and Associates, had a small but important part to play in the original construction. Our firm’s founder, Max Toltz, joined with a mechanical contractor, H. Kelly Company, to design and install the heating system for the cathedral. Three steam boilers provided steam heat to the cathedral proper and to the two adjacent residences. It is interesting to note that in 1910 the most economical means of driving the 75,000-cubic-feet-per-minute ventilation fans within the cathedral was to use a steam engine. Steam from the boilers powered the steam turbine, and the exhaust from the turbine was piped on to radiators for heating. Preservation of this monument will always be a priority, given its prominence and significance within the city of Saint Paul, the state, and the region. No matter what religious belief one holds, the cultural and historical significance of this structure is undeniable. In 2007, the Cathedral Heritage Foundation, a non-sectarian foundation, was established to provide a source of ongoing community funding for preservation efforts. Since then, over $5 million has been raised toward retiring the remaining financing cost from a 2000–2002 copper dome restoration project (a total cost of $35 million), restoring and expanding the cathedral’s two pipe organs, funding the creation of newly designed organ casework, and polishing 13,500 feet of marble flooring inside the cathedral. The restoration of Charles Connick’s stunning rose windows is the foundation’s current fundraising challenge. And like the architects, artisans, craftsmen, and laborers who never saw the Cathedral of Saint Paul as it is today, cathedral friends will take on the challenge of cathedral thinking: restoring the edifice now—and for a future they may never see.